THE old Downe Hospital site in Downpatrick will now go on the open market following a decision by Health Minister Edwin Poots. The hospital closed down in June 2009 when patients transferred to the new Downe facility in the town. A spokesperson for the South Eastern Health and Social Care Trust said: “All property disposal is governed by procedures set out by the Department of Finance and Personnel. The first stage is a public sector trawl to determine if any other part of the public sector may have an interest in the property which is surplus to Trust requirements. 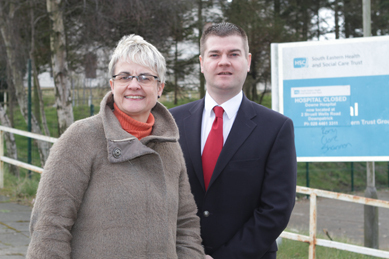 South Down MP Margaret Ritchie accompanied by Councillor Colin McGrath have welcomed the pending public sale of the old Downe Hospital site in Downpatrick. South Down MP Margaret Ritchie has welcomed the move by Health Minister Poots to finally put the whole site on the market. She said: “I have been pursuing the redevelopment of the former Downe Hospital, St John’s Residential Home and Pound Lane Clinic sites with the Minister for Health, and I am pleased the Minister has now confirmed that these sites will be placed on the open market in May 2013. “The sites will go on the open market with planning approval for mixed use development. I will be pursuing the Department of Health to ensure that the agent responsible for the disposal of the site undertakes a rigorous advertising campaign to ensure that every possible opportunity is taken to highlight the economic and social benefits of regenerating this substantial town centre site. The old Downe hospital site will be disposed off for development in a public sale. The new £64-million Downe Hospital located at the Downshire Estate in Downpatrick opened its doors in June 2009, and staff and patients finally moved out from the old Downe Hospital site close to the town centre. 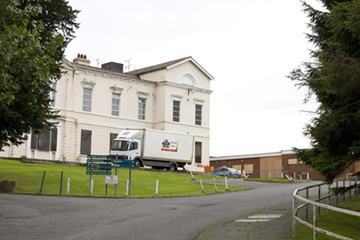 The old hospital had since ben subject to vandalism and both the St John’s and Pound Lane sites were subject to serious arson.